Police are investigating after a man indecently exposed himself to a teenage girl in the West Lindsey village of Glentham while she was walking to meet her school bus. Officers were alerted and attended the village to carry out enquiries and to try and trace the man. He is described as white, around 5ft 8in tall, and of medium/plump build. He is described as wearing cream coloured trousers, nothing on his chest, and a black and white ‘Scream’ mask on his face. At no point did he attempt to interact with the 14-year-old girl, who walked away and was collected by a family member shortly after the incident. 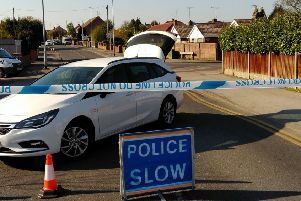 Sergeant Clive Farmer said: “This is an incredibly rare incident and one that we do not see in Lincolnshire very often. “Whilst I appreciate that this has been distressing for the girl and her family I would like to reassure the local community that officers will be maintaining a presence in the village over relevant times and will continue to make enquiries in an attempt to trace the person responsible. “If anyone has any information relating to this incident, or witnessed anyone behaving in a suspicious manner in the Glentham area at around 8am this morning, I would ask them to ring Lincolnshire Police as soon as possible on 101 quoting incident 70 of 19th June 2015.